View of the heritage village Duernstein in the Austrian Wachau Valley was executed by listed Austrian landscape and cityscape painter Anton Reckziegel (1865 Gablonz/Bohemia - 1936 Mödling by Vienna). 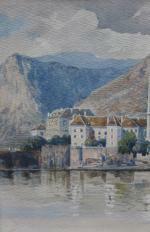 He lived and worked in Moedling since 1912 and exhibited his works at different art exhibitions in Vienna since 1917. Literature: Artist Lexicons by Thieme/Becker, H.Fuchs. Technique: watercolour on paper, matted and framed.